MANILA, Philippines - Which way is the cat going - is it UP or DOWN? 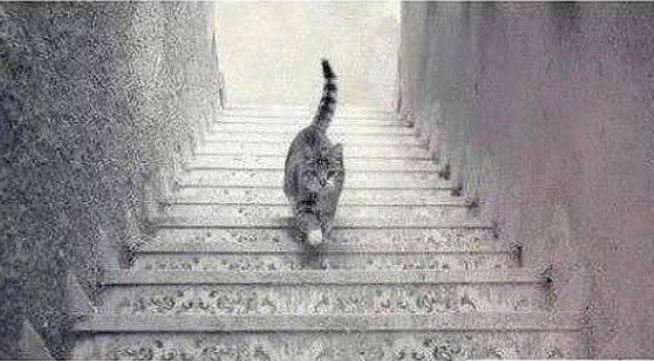 People on the internet can't decide as the image of a cat on the stairs creates optical illusion that can trick the eye. Is this cat going UP or DOWN? You decide. This is the new trending question on social media this week with majority of international websites have created a poll to get the pulse of netizens - #UporDown. The photo has started to spark online conversations worldwide when it was posted in the online image hosting service Imgur some six days ago where it has already racked up more than 300,000 views. A post on online platform 9gag.com created a debate with its headline “Forget about the golden dress.” It has generated more than 3,700 comments at the time of publication. Commenters are divided about the image ranging from the physiology of cats to the architecture of the stairs in the image. While the debate is fresh thanks to the controversial and viral sensation #TheDress last February, the photo of the cat is not new, and had been posted to website fay3.com in January 2012. As the public debate heats up, it looks like some advertisers are taking advantage of the situation and other memes related to #UpOrDown are being posted on social networking sites. What do you think? Is the cat walking up or down the stairs?